CONSIDER THIS SHOCKING FACT: while China's number one export to the United States is $46 billion of computer equipment, the number one export from the U.S. to China is waste $7.6 billion of waste paper and scrap metal. Bestselling author Clyde Prestowitz reveals the astonishing extent of the erosion of the fundamental pillars of American economic might beginning well before the 2008 financial crisis and the great challenge we face for the future in competing with the economic juggernaut of China and the other fast-rising economies. As the arresting facts he introduces show, the U.S. is rapidly losing the basis of its wealth and power, as well as its freedom of action and independence. If we do not make dramatic changes quickly, we will confront a painful permanent slide in our standard of living; the dollar will no longer be the world's currency; our military strength will be whittled away; and we will be increasingly subject to the will of China, Russia, Saudi Arabia, and various malcontents. But it doesn't have to be that way. As Prestowitz shows in a masterful account of how we've come to this fateful juncture, we have inflicted our economic decline on ourselves we abandoned the extraordinary approach to growth that drove the country's remarkable rise to superpower status from the early days of the republic up through World War II. For most of our history, we supported our home industries, protected our market against unfair trade, made the world's finest products leading the way in technological innovation and we were strong savers. But in the post-WWII era, we reversed course as our leadership embraced a set of simplistically attractive but disastrously false ideas that consumption rather than production should drive our economy; that free trade is always a win-win; that all globalization is good; that the market is always right and government regulation or intervention in the economy always causes more harm than good; and that it didn't matter that our factories were fleeing overseas because we were moving to the "higher ground" of services. 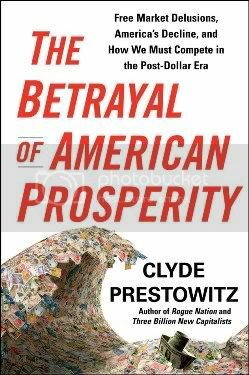 In a devastating account, Prestowitz shows just how flawed this orthodoxy is and how it has gutted the American economy. The 2008 financial crisis was only its most blatant and recent consequence.